Well we have had such a hectic summer that I don’t even know where to begin talking about it! Well let’s begin with the most torturous, nerve-racking event of the season: KAYAKING IN A STORM! The promotional photos show a bunch of very happy people swimming about in a lagoon with perfectly still waters. The water is crystal clear and deep green. There’s not a ripple on the surface of the water. In the background you can see a waterfall. In real life? Ah yes in real life! At first when we arrived, it all looked pretty neat and normal. The instructor taught us how to handle a kayak and oars. Easy peasy. We put on our lovely crimson life jackets. Pay attention to those life jackets, in a storm they can save your life haha. Don’t we look happy in this happy Before photo? I always say, I’m the pasty white shortie at the end next to “Ermenegildo”, the one all dressed in white. I don’t think I’d qualify for Baywatch. Now, those tall, shapely, tanned things in bikini on the other side, on the other hand……..
Well at any rate there is no way I would ever jump into a kayak in the middle of the sea without a life jacket. As we pushed out into the ocean, the water was a bit rough, but nothing we couldn’t handle. Waves kept crashing over the kayak and submerging it under the water. I was terrified! But we soon discovered that kayaks are built to be practically unsinkable. No matter how enormous the waves or how many crashed over the kayak, the kayak always comes floating back up again. And it won’t capsize either. So you can ride out tranquilly. You can see the storm clouds starting to gather in the corner. 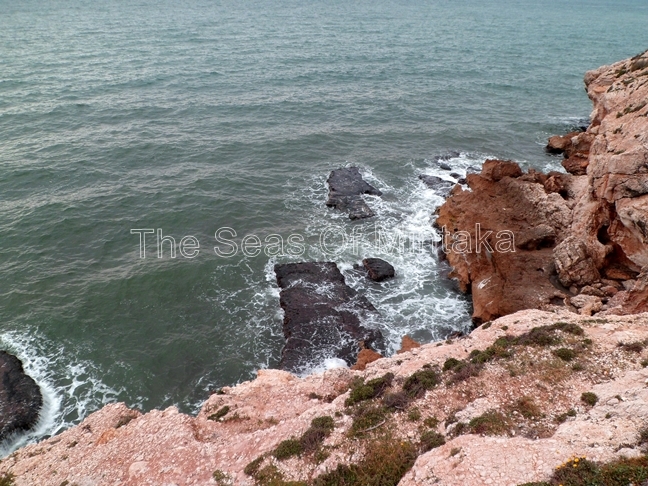 We began the route but the sea just got rougher and rougher. A tour through some underground caverns underneath the Caves of Nerja is usually included in this route, but the day we went, the sea was so enraged we couldn’t enter the caverns, because the waves were too strong and big and high. We did make it to some sort of sheltered enclosure where we could jump out of the kayaks and swim around a bit. After that the monitor guided us on a fun obstacle course where we had to manoeuvre our way through some very narrow channels between tall rocks. That was easy and a lot of fun. The sea there was calm, and there was no hurry. At this point, however, a rollicking storm rolled in and we were forced to head back without finishing the route. It was a good thing we didn’t continue, because we had our hands full then trying to avoid getting dragged across the strait to Africa! No more photos from here on, of course. The instructor had his hands full just trying to prevent us all from getting dragged to Africa! So huge enormous waves were crashing all over the kayak all the time. The sea kept trying to pull us towards Africa and we had to row very very fast just to avoid getting dragged out to the open sea. No matter how fast we rowed, the kayak kept getting tossed about where we didn’t want to go. This was NOT what we’d bargained for when we signed up! Where was the calm lagoon and the crystal clear water? All we had were deep dark turbulent waves! After about five hours of arduous rowing we finally made it back to the beach. As if we weren’t already exhausted enough, the instructor then made us jump out of the kayak a certain distance from the shore, because they couldn’t drag the kayak to shore with us in it! I leapt out and immediately got pushed under the water, because the water was sooo deep I couldn’t touch the bottom! Good thing I had the life jacket on. Although on the other hand there was no way I was going to jump into deep, rough waves without a life jacket I can assure you! After we swam to shore, if it had been up to me I would’ve just hurled myself down onto the sand and lain there for three years! However, since no one else did that and everyone else had the stamina to finish the activity with dignity, I wasn’t going to be any less than anyone else haha! 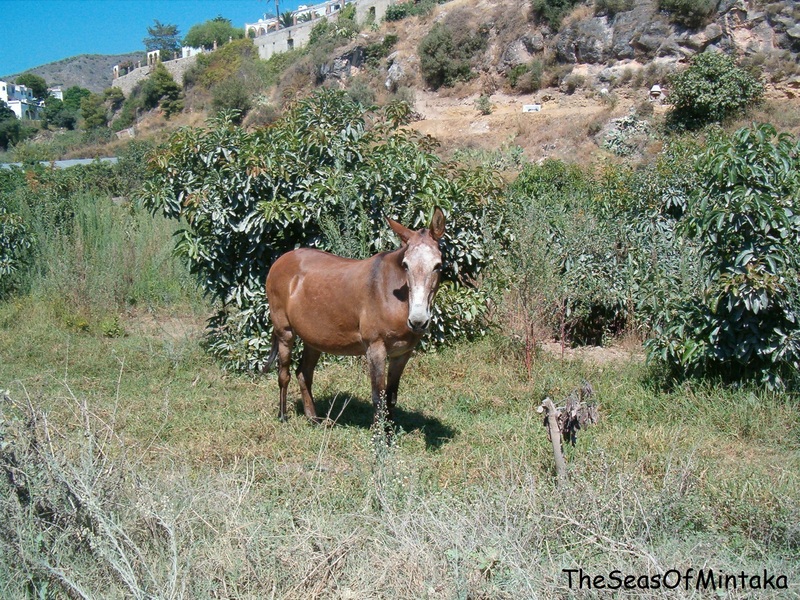 But as soon as we returned the oars and life jackets, I grabbed my son “Ermenegildo” and dove onto a beach wall and vegged out there for about half an hour, because my head kept spinning round and round. When I’d recovered enough to walk around without falling down, we went to pick up the photos from the instructor. Then we ate the sandwiches I’d brought with us. Then, unbelievable though it might seem, given that it was still cold and stormy (highly unusual weather in the middle of a southern Spanish summer) and a strong wind was still blowing and we were freezing to death since we were all wet because I hadn’t brought a change of clothing (I thought it was going to be hot and sunny and we’d dry right off), in spite of that we had an ice cream! Yes we are crazy! Then we had a beautiful relaxed stroll back along the seaside promenade. My son bought some souvenirs (ie. had me buy him some souvenirs). Well Nerja’s pretty famous. It’s a lovely town and well worth the bother of visiting it. And of course, you can get souvenirs there. Nothing spectacular about this anodyne photo. Just wanted to show the highly unusual view of storm clouds over Nerja, something you would probably not often get a chance to behold. After that, idling our way back up towards the historic town, we lucked upon THE MOST DELICIOUS, DELECTABLE Indian restaurant I have ever visited. It’s called Masala House, if you happen to be in Nerja and you would like to try it out. Best prices I have ever seen here in the south of Spain! 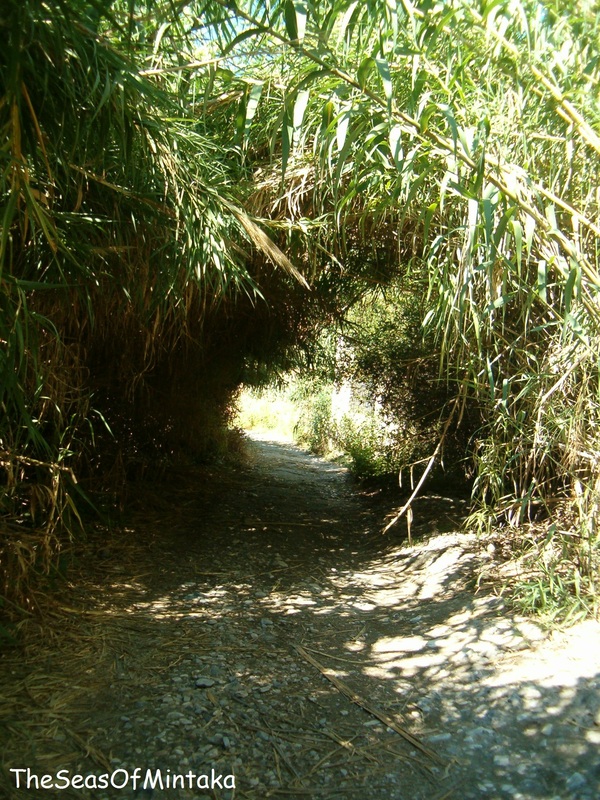 You can find it on the winding road that winds down to Playa Burriana. We picked our way back up to the historic centre and from there to the highway to take the bus back to Malaga. The bus driver had the great good fortune to count on air conditioning in the bus and he turned it up to Super High, and we were still wet, so we had a miserable, freezing cold ride back to Malaga. Fortunately, we had a hot shower waiting for us back home haha. We went on the kayak tour with Educare Aventura (no affiliate link and this is not a sponsored post), 600.62.00.54, www.educareaventura.com (where you will see the happy photos of happy shining people swimming in lagoons as still as a millpond). The kayaking activity costs 20 euros per person (children pay less but I assure you, a child will not be able to carry out the activity in a storm!). They have several outings a day during the summer, both morning and afternoon. Less in the winter. 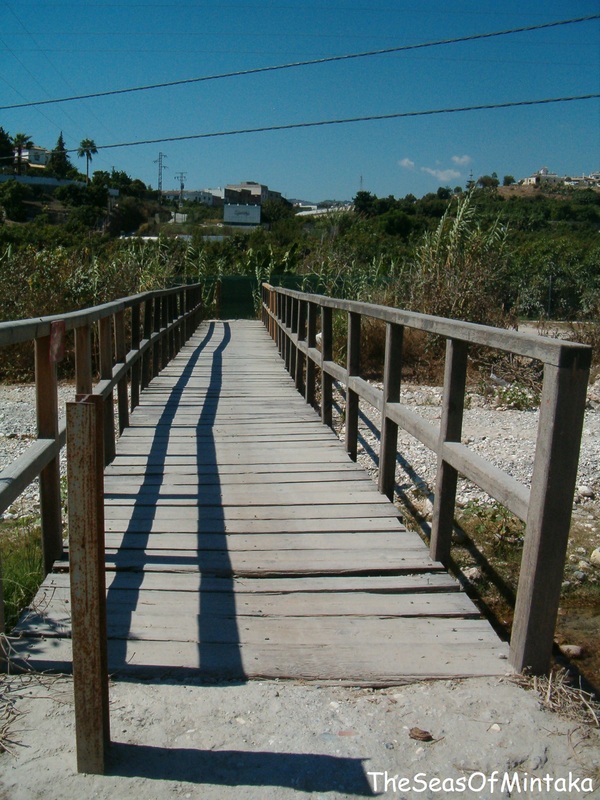 Their office is located at the far end of Playa Burriana, if you are walking to the beach from the centre of Nerja. Just keep crossing the beach all the way to the end. You’ll recognize them because they have some sails out front. Kayaking photo credits to Marcel, our instructor at Educare Aventura. The rest of the photos are, as usual, mine. HARROWING – New Thriller Up For Sale on Amazon! Well, looks like it’s time for another sightseeing / travel post. I promised my son I would take him to the Caves of Nerja for his birthday. His birthday was at the end of last year, so you can see I’m not very current with posts haha! 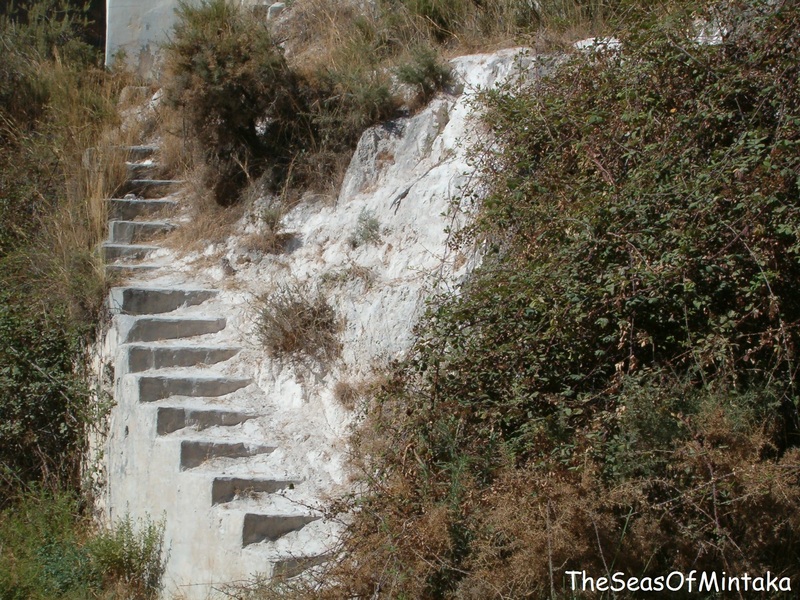 If you live around here or have ever come for a visit, you are probably familiar with the Caves of Nerja and you have probably dropped by to discover them. 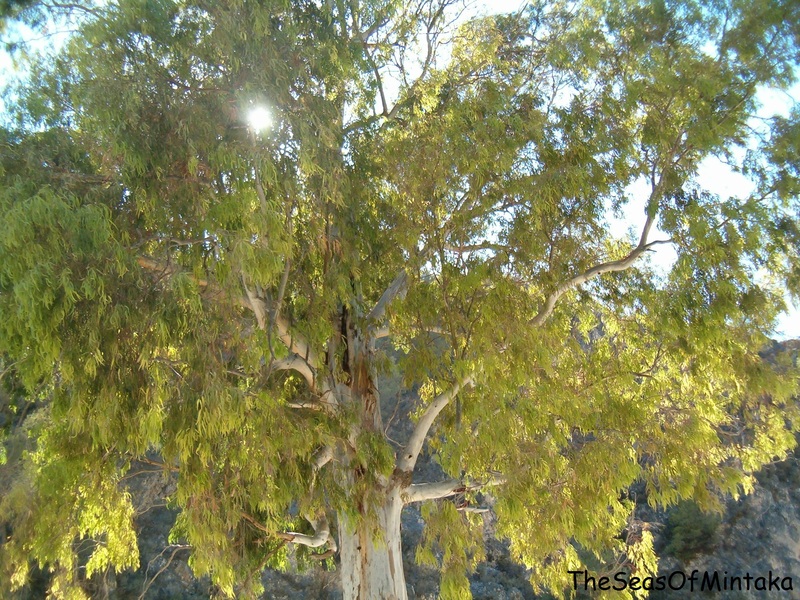 They are very well known and most tourists do try to make an effort to stop by and visit them. The Caves of Nerja were formed millions of years ago during prehistoric times by rainwater filtering through the porous rock and slowly gouging out cavities and openings underground. They were almost continuously inhabited by cavemen, who left several paintings depicting everyday life in their times. These cave paintings aren’t open to the public, in order to preserve them. Even though they are so famous today, no one knew about these caves in modern times until they were discovered in 1959. Now, it’s very common for caves to be discovered while public works are taking place excavating tunnels for highways, parking lots or other things that are habitually built underground. 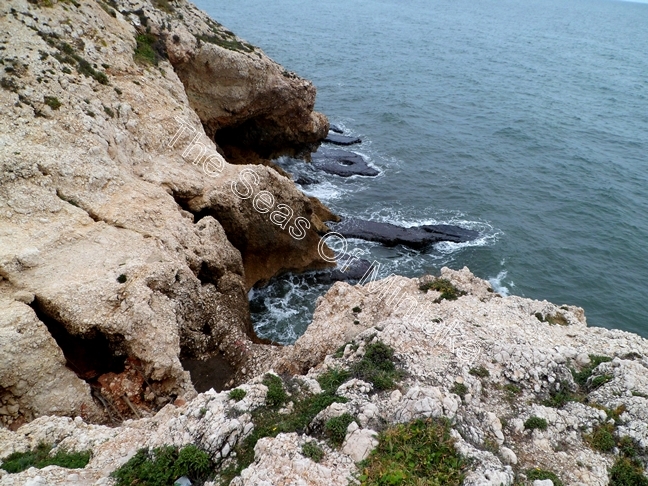 But that wasn’t how the Caves of Nerja were discovered. 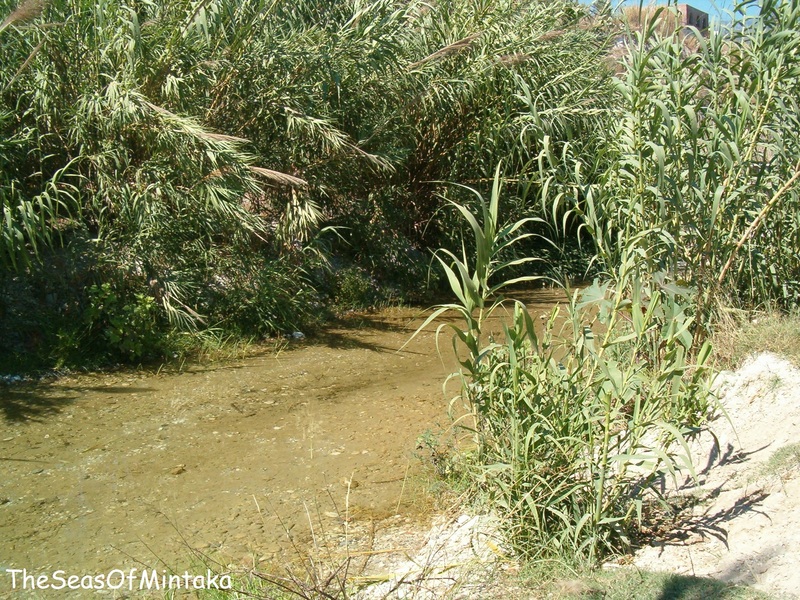 A group of five boys from the nearby village of Maro liked to wander around in the fields and go bat hunting. They were aware that there were some holes where literally hundreds and thousands of bats would fly out from at dusk, and they liked to go chasing these bats. One day, they thought they would explore more deeply into the holes where these bats flew out from. They tried to drop down into one of these holes, and soon found out that it wasn’t exactly just a tiny little rabbit warren haha! It was, in fact, an enormous, immense, gigantic cavern. When they dropped down into the cavern, they discovered skeletons lying around. They were very excited and were soon sharing their findings with friends, neighbours and teachers. Word spread, and it wasn’t long before scientists and experts started swinging around to check out this new finding. Very soon they realized the immensity and significance of this discovery. 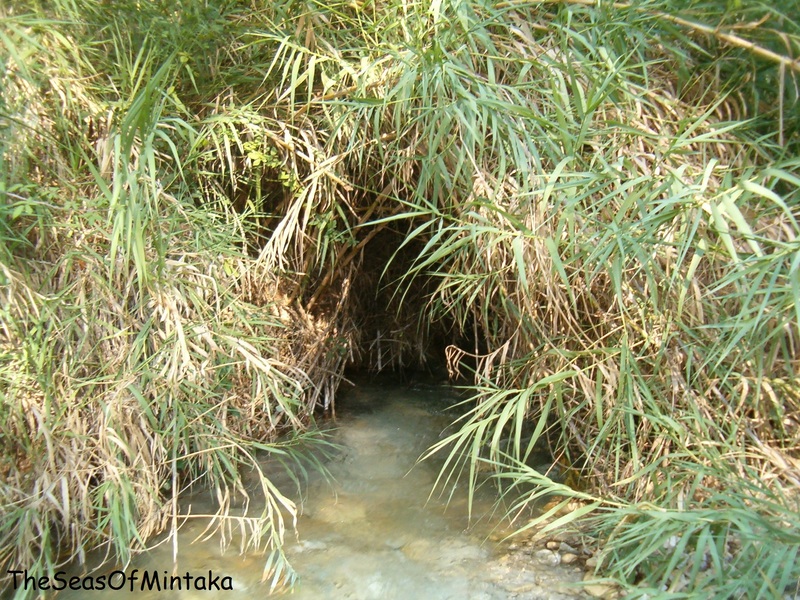 Archaeological research began on this site, and the following year the caves were opened to the public. The five lucky lads who discovered the caves weren’t forgotten. They are immortalized in a statue that you can see in the town of Nerja. The Caves themselves are divided into three galleries, only one of which is open to tourists. The two deeper galleries, the Upper Gallery and the New Gallery, can only be visited in special, pre-arranged tours. A series of pathways cuts through several halls and leads you in the end to the main showcase of the Caves: the Hall of the Cataclysm. This is the famous hall where you can see the super gigantic column in the centre. This is the largest naturally-occurring cave column in the world. It reaches from the top of the hall into depths so profound that you can’t really see the bottom of it all. The column is 32 metres high and occupies a space of 3000 m3. We went in the afternoon so we could see the guided tour, but I’m not too sure it is really worth the bother of having to jostle with all the crowds. If we ever go back again we will probably go in the morning, when you don’t have to go in a group and you can wander about freely. We got assigned to a tour guide who pretty much didn’t say a word to us, other than telling us which direction to go in the labyrinthine trails which appear to wander about in all directions. Fortunately, we hung behind, and we were able to catch other tour guides who were a little less laconic. You can see from this natural cave design where the Moors got their inspiration for their incredible artwork and architecture that you can admire in places like the Alhambra of Granada. There is a vast space which is usually filled with seats, where concerts and dance shows take place during the summer. These concerts take advantage of the incredible and formidable natural acoustics in this area. You can hear these acoustics if you scream in the hall (when no one is around, of course): you will hear your voice echo all around you. The sound is just amazing. 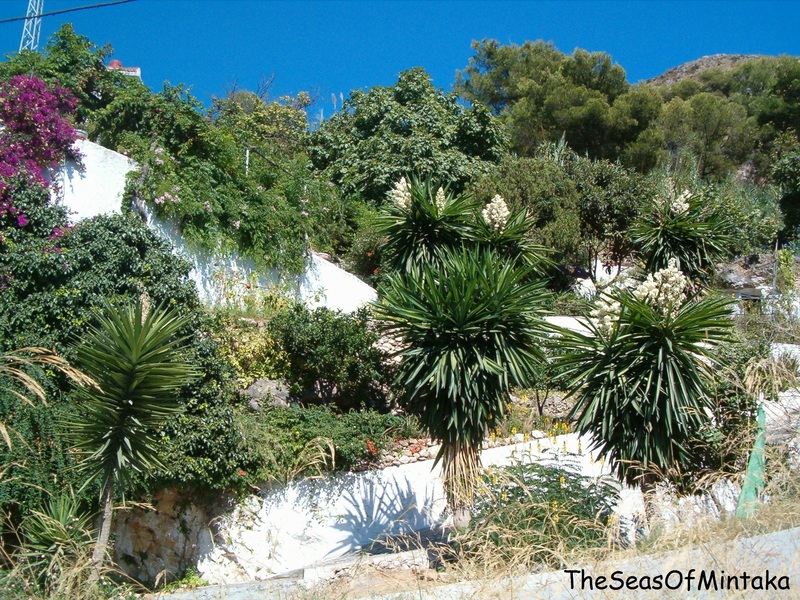 Outside the Caves, you can wander around and enjoy the Hispano-Arab garden, which is a small pool of water covered with beautiful tiles. There are also playgrounds and cool paths with benches to stroll about or to sit and rest. There is a cafeteria-restaurant where they serve drinks at a most reasonable price, where you can freshen up before the long ride home or grab a bite to eat. All in all, this is a really great site for a day trip. 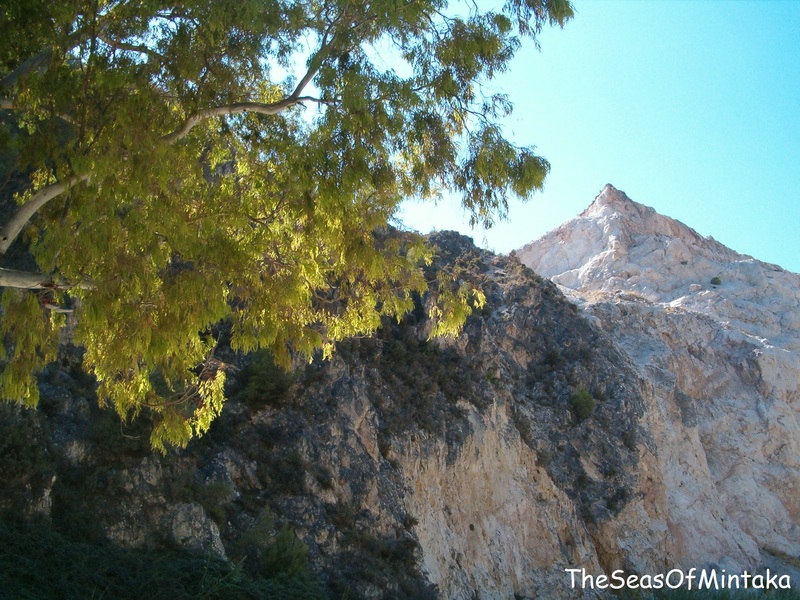 You can just come to enjoy the caves, or you can combine it with a trip to the town of Nerja. 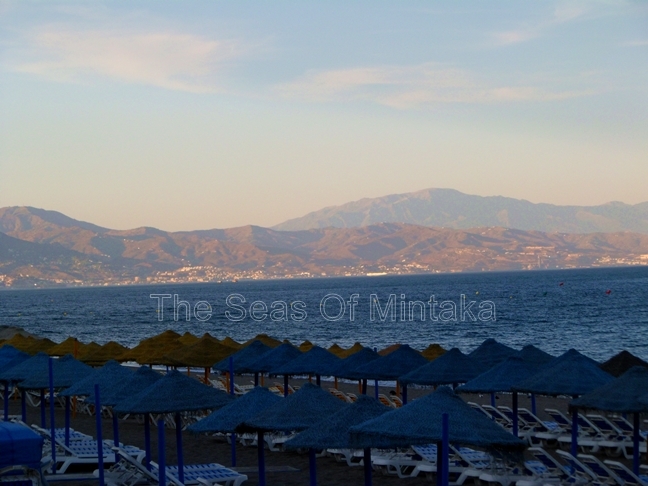 We have been to Nerja a few times and if I ever feel up to it, I might zip up another blog post dedicated just to the town of Nerja. 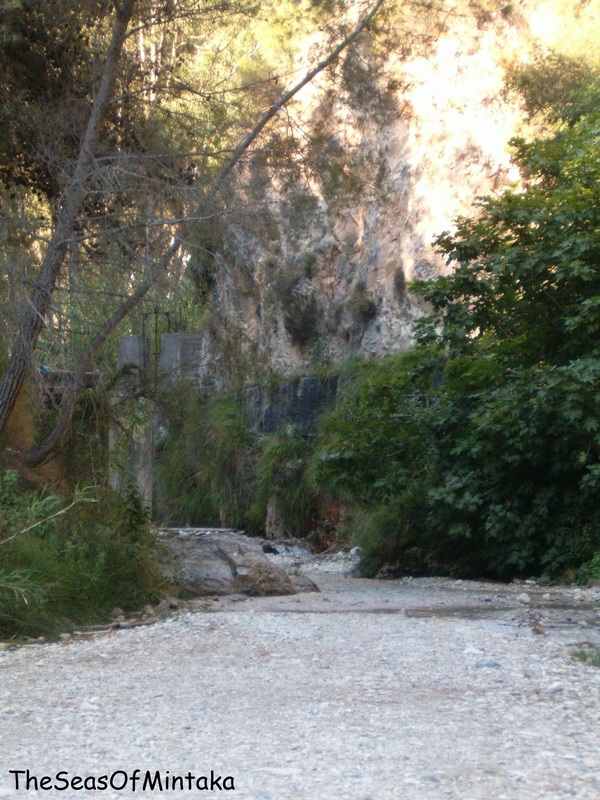 The Caves of Nerja are open from 10 am. to 1 pm. in the mornings for unsupervised visits. At 1 o’clock the first guided tour begins. After that the Caves close for lunch, and re-open at 4 in the afternoon. From 4 to 5:30 there are guided tours every half hour. There is a special schedule during the summer months, so if you are planning a visit in the summer, check their new opening hours for that period. They also offer special visits (with different prices) which must be reserved beforehand. These visits can be reserved through internet. I do like the Caves of Nerja, and I consider it a must to visit them if you are in Malaga on holiday. However, I feel that in matters of cave exploration, the best kept secret in the region is definitely the Treasure Cave. Check up my blog post on the Treasure Cave here. it’s a “wet” cave, so you can see basins filled with water and you can even dip your fingers into the water and rub it on your face (the water is naturally clean and clear, it’s rainwater that has filtered in through the porous rocks). I would be careful which basins you dip your fingers into, though, since some of these basins were used for animal sacrifice! there is an archaeological park at the Treasure Cave that you can visit for free, and it gives you archaeological and scientific information. You can also see reproductions of some prehistoric cave paintings in this park. Children will probably be bored there, however. I speak from experience! I saved these two photos for last because they seemed rather special. I thought that both these photos looked sort of like the book cover for some Lord of The Rings-like novel. Of course they are not as good quality as a real, true, bona-fide professional book cover, they’re grainy. But I thought they still rather looked like something out of The Lord of The Rings. 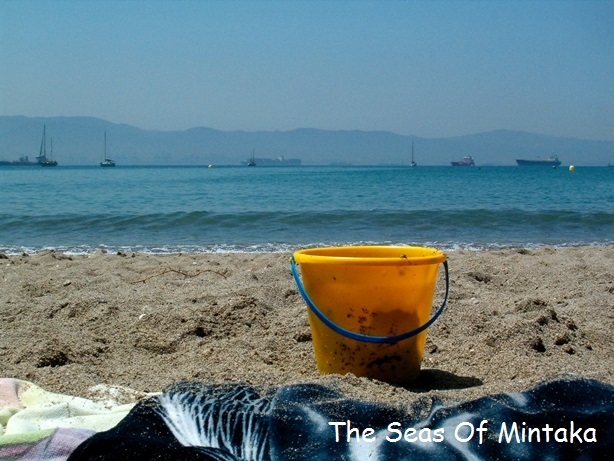 Since it seemed the appropriate time of the year for this, I started a collection of beach photos that I’d made throughout the years. But then I got bored. So these are the photos that I managed to finish editing before I got bored. 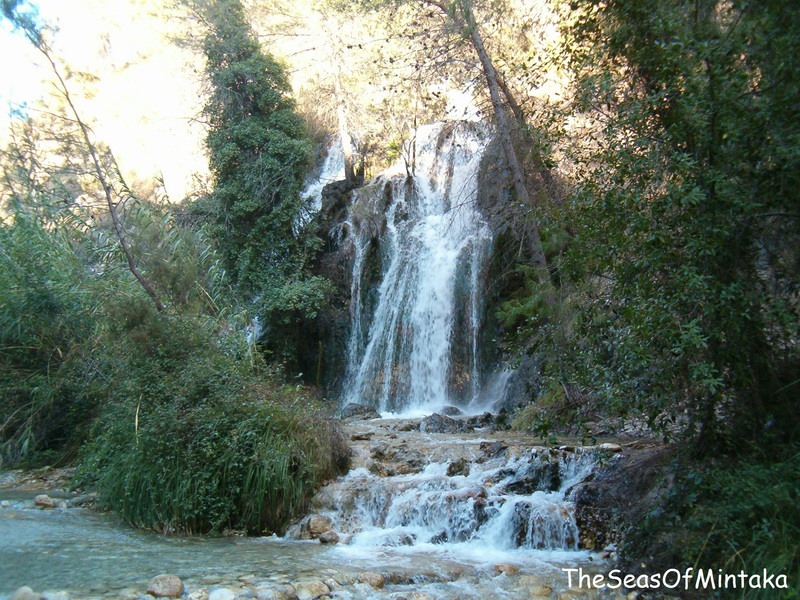 Pretty much all of these photos are from around here (Malaga). 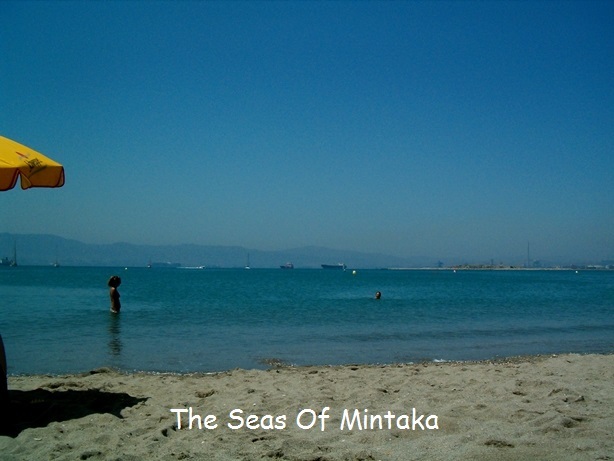 I really wasn’t much into photography before I came to Malaga, so I have very few (if any) photos of beaches from any other places. This beach is in La Línea de la Concepción right up against Gibraltar. It’s a very beautiful beach, as are all beaches in Cádiz, with fine white sands and warm Caribbean blue water, mmmhh. Wish the beaches here in Malaga were like that haha! You can see that hazy blue floaty mass of land across the way. It’s Africa! Yes you can really see Africa from this beach. It looks so close. It looks like you could almost swim across. 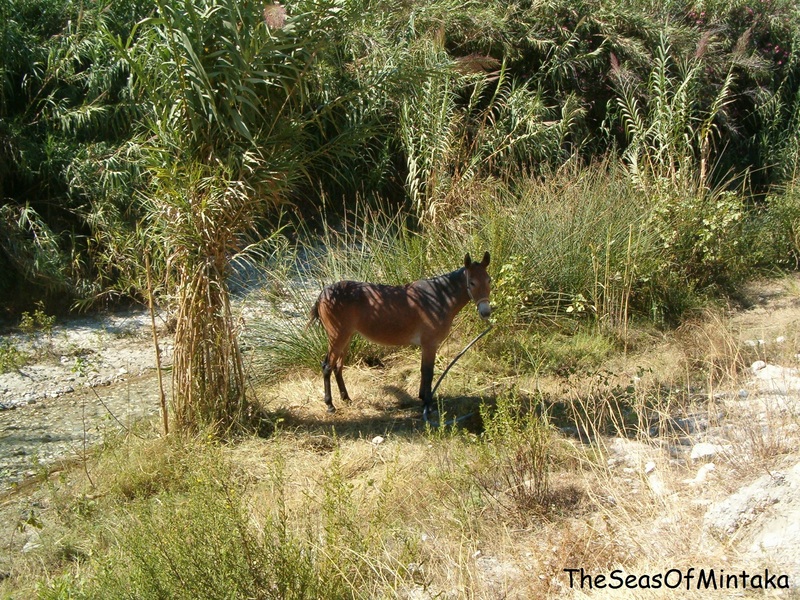 But the very narrow strait that separates Spain from Africa is deceptively treacherous and full of dangerous undercurrents. This was a winter’s day in Chipiona. We went there with an organised group mainly so we could see the sights. Well we did get to see the sights, but most of the group spent most of the time going to visit – Rocío Jurado landmarks! Like her tomb at the local cemetery, her home or a huge statue of her. Rocío Jurado was a very popular, now deceased flamenco singer. This is in Torremolinos again. Somehow I actually managed to grab these beaches empty! Maybe it was off-season hehe? And again. But many years ago. 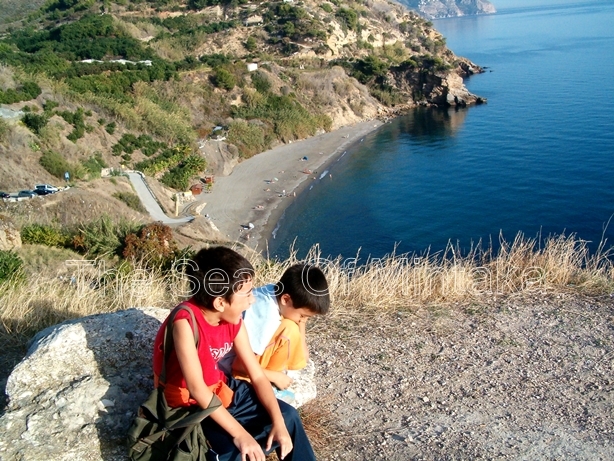 My kids in Maro near Nerja. Check out the people bathing in November! Although not quite a beach, I couldn’t help including these darkly dramatic winter pics. 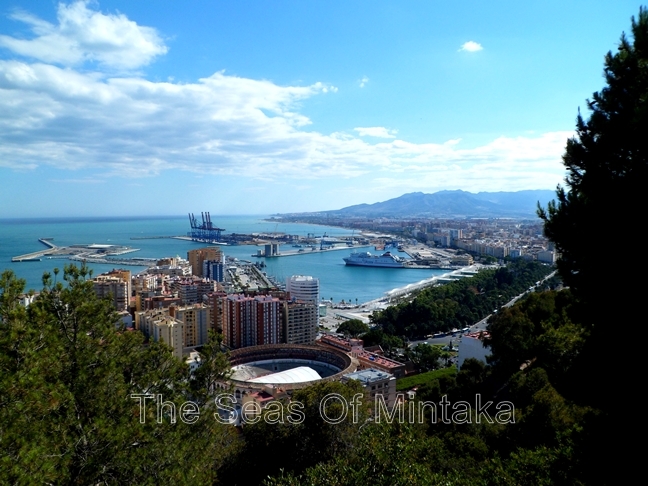 A view from a classic viewpoint of the Port of Malaga. Right now that it’s raining and raining and raining, seems a nice moment to remember bright, sunny days and hot excursions to the countryside and the mountains. Not that I have anything against the rain but quite the contrary, I LOVE rain. Which is why I could never live in a desert. However, the rain does make fun excursions and hiking hard. So now is the moment to curl up under the quilt and nostalgically relive old photos of fun times from the past – that is, this summer. 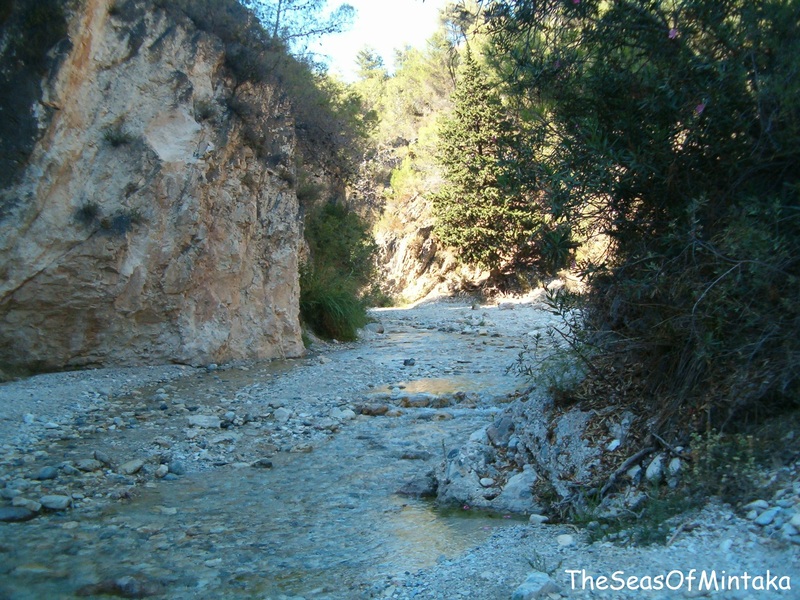 One of the places we visited this summer is the CHILLAR RIVER near Nerja, in the south of Spain. Lots of people go there, it’s quite a popular spot with both locals and foreign tourists. Well foreign tourists who don’t mind a little bit of roughing it out in the country, that is. No relaxing and romantic joyrides in horse-drawn carriages here! If you have a car, you are really in luck! 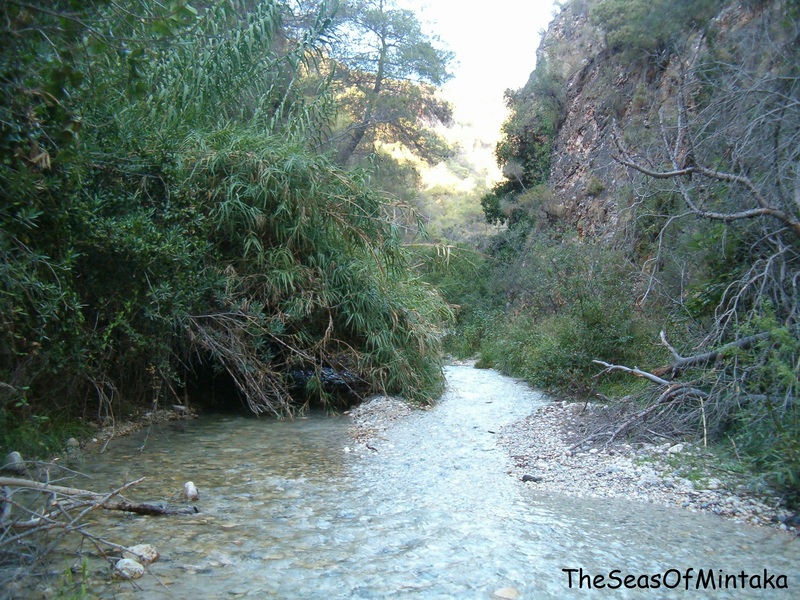 You can drive right out to the beginning of the trail and save your energy for enjoying the beauty of the area. And if you don’t have a car, then cry! Okay, then after you’ve had a good cry, you can still be glad that this is one route you don’t have to miss just because, unlike about 90% of the population, you are not fortunate enough to own a vehicle of your very own. You can still go there by foot. 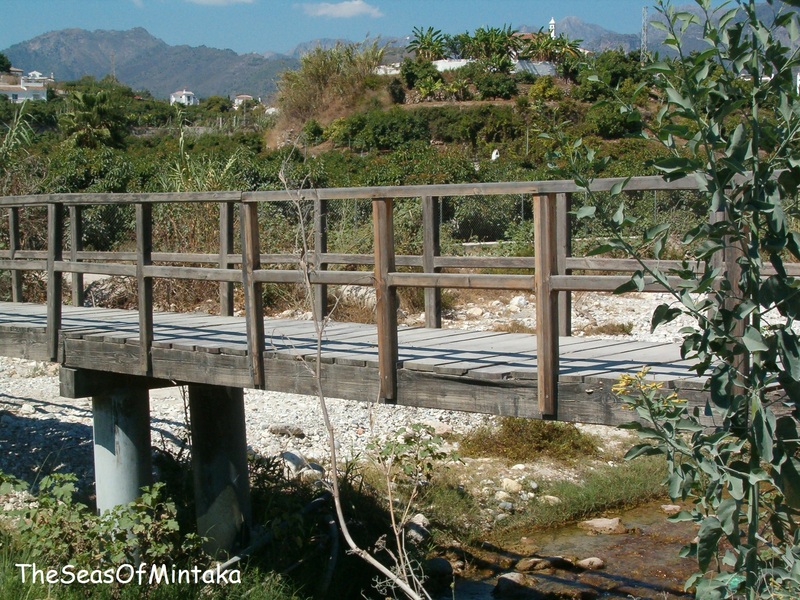 From the town of Nerja, walk towards the river. 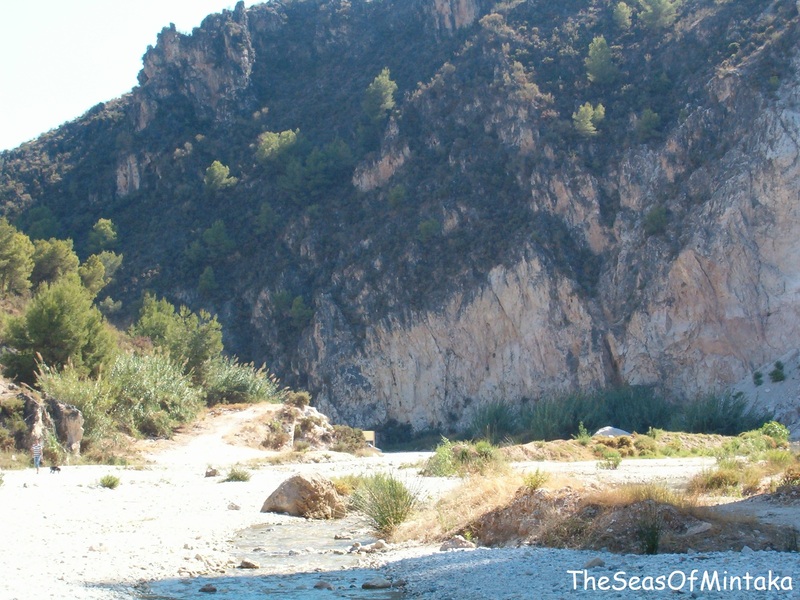 The river is at the entrance to Nerja if you are arriving from Malaga. It is very close to the bus stop, so even if you must use your little legs, they won’t get very tired. If you are lucky enough to count on the services of your very own car, please do give me a call, and give us a lift the next time we go out there to the Chillar River! Although the very most fortunate among us could probably hitch a ride with one of these horses! 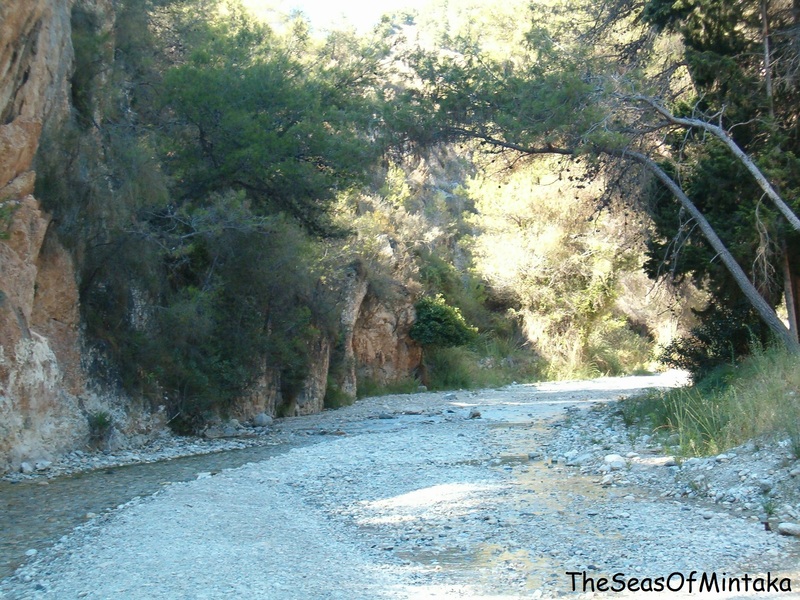 Okay, on a more serious note, if you arrive by car you can also go down to the dirt road that follows along the river, on the Nerja side. 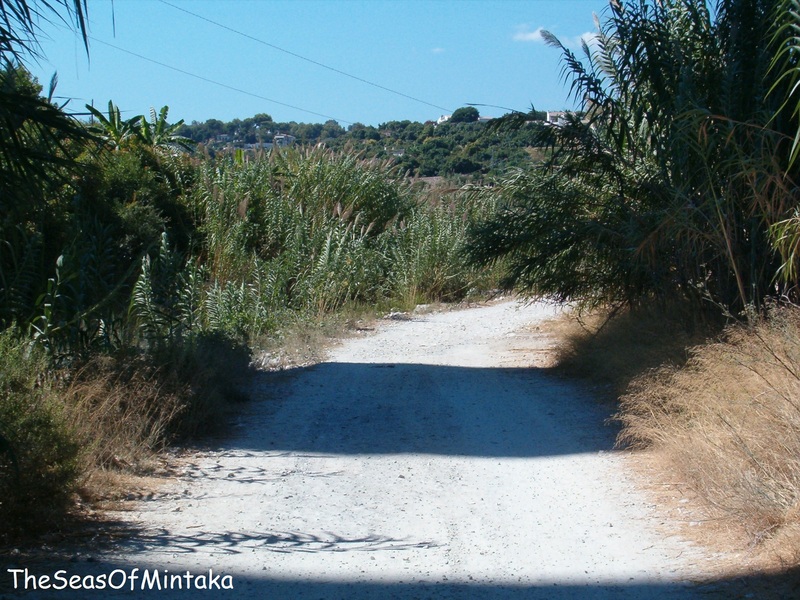 Either way, all you have to do is go up this dirt road. It’s very clear and straightforward, no danger of getting lost. The road winds along the river all the way to the top. By car it’s maybe 15 minutes. But if you’ve got to patter patter it all the way, it takes about an hour. You will know that you have arrived when you reach a very large clearing where, chances are, a ton of cars are already parked. Here you must get out of your comfy vehicle and start fording the river. Fording the river is lots of fun and the only way to walk along it, so I thoroughly recommend that you come with water shoes. Plastic open sandals, that still wrap around the foot and therefore don’t fall off, are ideal. Now all you have to do is go up the river and enjoy the scenery. 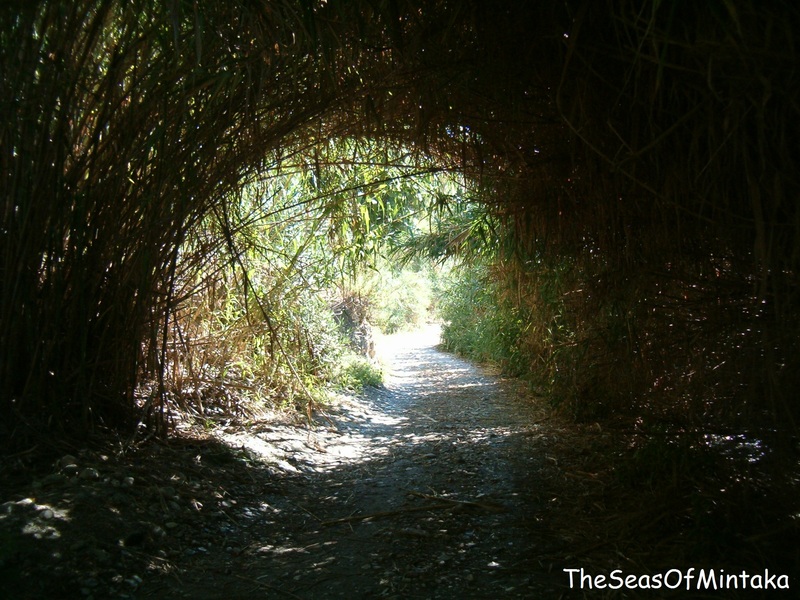 Along the way you might encounter a variety of mysterious tunnels and archways. This, on the other hand, is actually a garden on someone’s property, though it might be hard to believe or discern. The “parking lot” is actually nestled within the confines of what was once a lofty and powdery white marble quarry, although I believe it is no longer in use as such. At any rate, you can see the very high mountains of powdered alabaster soaring overhead and engulfing the entire clearing with its bright shadows. These quaint steps carved into the stone lead to a tiny shed, I have no idea what this shed is used for or what it is. And now, at very long last (or at least you can say at very long last if you arrived by foot, of course if you drove your vehicle up to this point, it would have been nothing but a short breeze for you) we reach the entrance to the actual river itself, the entrance to the Chillar River. 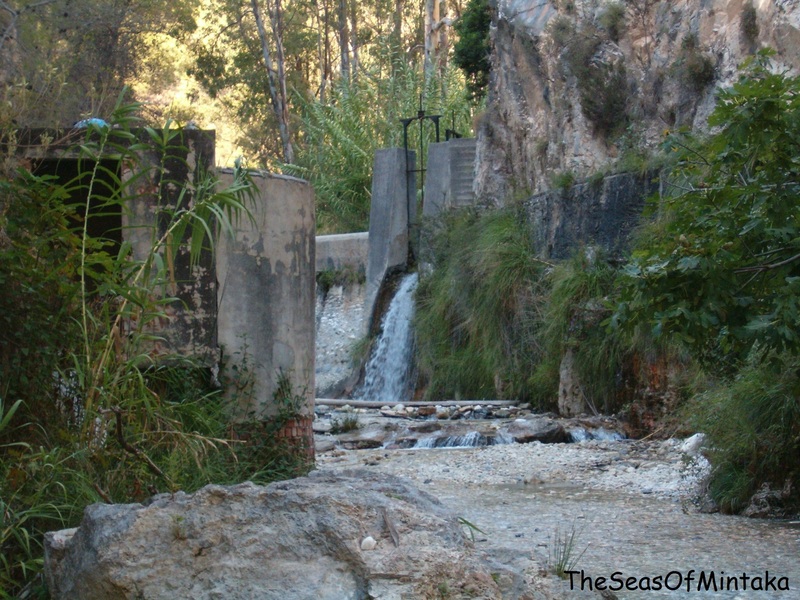 This, I believe, is or once was some sort of rustic hydroelectric power plant, although it’s very small. Perhaps a water mill would be a more appropriate name. At any rate, we didn’t climb up to have a good look. Yet another mysterious tunnel. My son actually went in there, he’s a little mite! Here you can see that the water is so crystalline clear (but I wouldn’t drink from it!) that it looks like a spotless white immaculate path. But actually, all that is water underfoot. 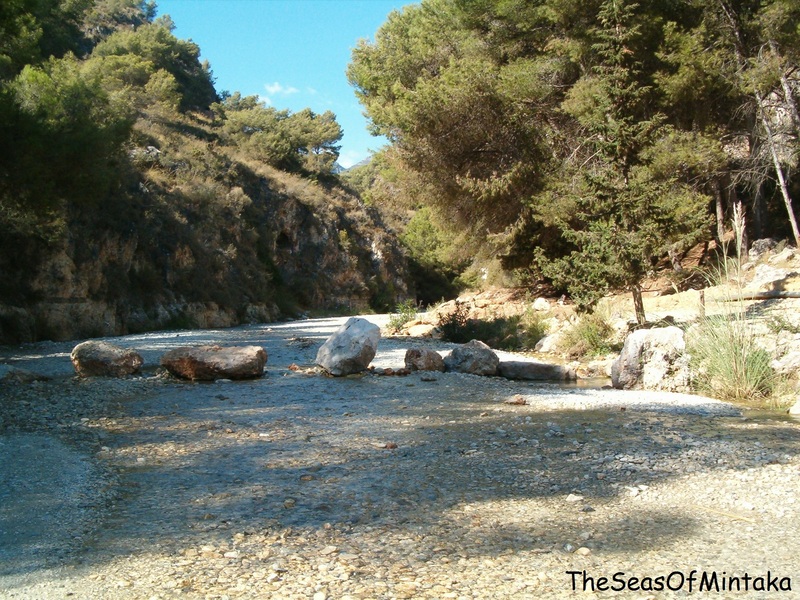 When you reach this gorge it’s a magical moment: because it’s the moment when…… your son’s sandals break! Which was very opportune, however, as it was getting late. Time to return home, as you can tell by the inexorably lengthening shadows in these last photos.